Through today, portProxy.bin has been eating up my CPU, constantly using about 60% and making the fans in my computer whizz up. I'm guessing it might be connected to my VPN use, but now I haven't been running any VPNs for some hours and portProxy has still been staying at around 60% CPU usage. I use Cisco AnyConnect to access my schools private network and Disconnect to block trackers and hide my location. Sometimes I forget to disable Disconnect before trying to connect through Cisco AnyConnect, but then AnyConnect can establish a connection and I'm reminded I have Disconnect running. Could this have something to do with it? I haven't figured out what portProxy.bin is or why it was hogging my CPU, so if you know this, please edit and replace this text with an explanation. I did a restart and that corrected the problem. Not the answer you're looking for? Browse other questions tagged macbook network vpn cpu activity-monitor . 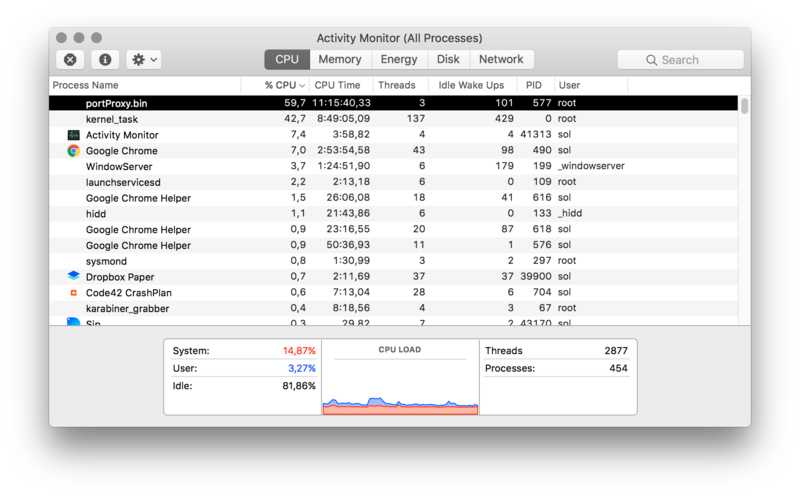 iPhone: What is `accountsd` and why is it using 80% CPU? What is “photoanalysisd” and why is it using 77% of my CPU?